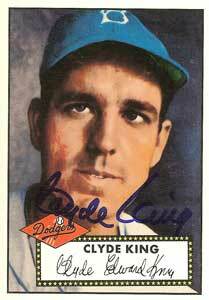 Former Brooklyn Dodger pitcher and New York Yankees manager Clyde King died November 2, 2010, in Goldsboro, NC. He was 86. King made his debut in 1944 during the height of World War II at the age of 19. In a February 2008 interview with King, he described how he broke in with Brooklyn. "I came right from the University of North Carolina right to Brooklyn at 19, almost 20 years old," King said. "There was a shortage of players at that time. I got to stick right there. I had a wonderful time with the Dodgers. I enjoyed Jackie [Robinson]. Campy caught me in my best year in 1951. We had a lot of good players. [Don] Newcombe, [Dan] Bankhead, among others." He played seven seasons with the Dodgers and Reds between 1944 and 1953, retiring with a career record of 32-25, including 14 wins during the aforementioned 1951 season. King joined the Yankees organization as a scout in 1976 and served various positions within the organization including pitching coach, manager, and general manager. During the 2008 interview with King, he reflected on his time with the Yankees as he was about to embark on his annual pilgrimage to Tampa as a guest of George Steinbrenner. "I was with the Yankees for 33 years," he said. "I stay with Mr. Steinbrenner. He told me not to worry about scouting, just to stay in his box with him. We've done this for the past three years. My wife says he's rewarding me for what I did in the past."